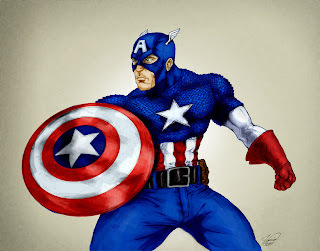 By popular demand I finally colored that Captain America... well, technically I didn't. I grew tired of the old sketch and decided to start from scratch. Although I think this is a better composition and has more of the characters spirit, I'm not totally satisfied. I'm pretty happy with the colors on this one but once I did color it I noticed a few flaws in the figure. It's also a bit stiff if you ask me. i like the attention to detail--especially the chainmail and observational details on the belt. cool man, keep 'em coming! thanks a lot j.hova! I haven't exactly been maintaining the weekly schedule... however, I'm trying to post regularly. they are coming. You keep it up too man.